We are fortunate to have the opportunity to spend a great deal of time in two of the most magnificent areas of the west for photographing wildlife and landscapes: Greater Yellowstone and southern Utah. We have traveled to many of the national parks in the western U.S. and Alaska, and to western Canada and the Yukon Territory. 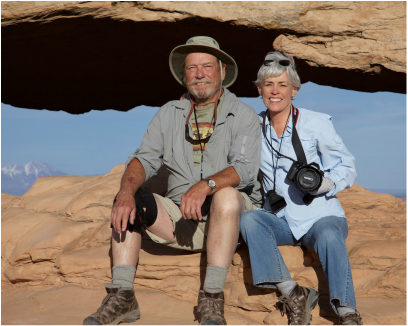 Drawn to nature, mountains, and wilderness all her life, Jean easily developed a special interest in nature photography, including wildlife, birds, butterflies, wildflowers, and landscapes. In addition, she shoots and edits video. Randy has always been an adventurous outdoorsman. He is a biologist by training and a certified Idaho Master Naturalist. He shoots both still images and video. He is a woodworker and makes our custom wood frames as well as other custom wood work items. We both love to be in wild places, and favorite activities are hiking, bird watching, river rafting, and kayaking. We also enjoy photographing weddings, families, portraits, and senior photography. Check out Jean's photo blog for commentary on some of our favorite places and images. We participate each year in selected juried art festivals. Our photographs have won awards in several local photography contests and have appeared regularly in The Island Park News. Our images have also appeared in print in calendars, postcards, a 14-page magazine photo spread, and other materials. We have donated licensing rights to images and/or video to the Grizzly & Wolf Discovery Center, The Nature Conservancy in Idaho, Teton Regional Land Trust, Land Trust Alliance, Dubois Grouse Days, North American Grouse Partnership, Henry's Fork Legacy Project, and California State Parks. We are members of the Cedar City Arts Council in Cedar City, Utah. Contact us for a reply by email. Please do not include credit card information on this contact form.